Identification: Becker (1983); Page and Burr (1991); Jenkins and Burkhead (1994); Vladykov and Kott (1980) provided a key to the ammocoetes of lampreys found in the Great Lakes region. Eel-like in appearance, but not an eel. Sea lamprey is a cartilaginous fish without jaws. This species has two close dorsal fins, no paired fins, seven gill openings, and a large round mouth with sharp, curved teeth. (Page and Burr 1991; Jenkins and Burkhead 1994). Native Range: Generally marine but ascends freshwater rivers to spawn. Atlantic Coast from the Gulf of St. Lawrence to the St. Johns River, Florida; Atlantic Coast of Europe and Mediterranean Sea (Page and Burr 2011). Table 1. States with nonindigenous occurrences, the earliest and latest observations in each state, and the tally and names of HUCs with observations†. Names and dates are hyperlinked to their relevant specimen records. The list of references for all nonindigenous occurrences of Petromyzon marinus are found here. Means of Introduction: Controversy exists as to whether the sea lamprey is native to Lake Ontario. Several believe it is native (e.g., Lawrie 1970; Smith 1985), suggesting that sea lamprey found in Lake Ontario and its tributaries, the Finger Lakes, and Lake Champlain represent relict populations from the last Pleistocene glaciation. Those contending that it is not native believe that this species, unknown in Lake Ontario prior to the 1830s, had most likely entered the inland lake from Atlantic coastal drainages via the artificially created Erie Canal (e.g., Emery 1985). Whether or not the sea lamprey is native to Lake Ontario, this species is not native to the other Great Lakes and tributaries where it is now readily found. The sea lamprey was previously prevented from spreading into Lake Erie and the rest of the Great Lakes basin by Niagara Falls. The Welland Canal, opened in 1829, bypassed Niagara Falls providing a route to Lake Erie from Lake Ontario (Aron and Smith 1971). From the opening of the Welland Canal (1829) to the discovery of sea lamprey in Lake Erie (1921), there is almost a century difference. Yet sea lamprey was found throughout the Great Lakes to the farthest Great Lake, Lake Superior, within twenty-five years of their arrival to Lake Erie. The improvements done to the Welland Canal in 1919 are likely the change that facilitated sea lamprey immigration into Lake Erie (1921) (Great Lakes Fishery Commission, on-line resource). Status: Established throughout the Great Lakes region. This species was common in lakes Michigan and Huron by the 1930s and in eastern Lake Superior by the 1940s; it never became very abundant in Lake Ontario (Applegate 1950; Emery 1985) or Lake Erie (Smith 1985). Impact of Introduction: Attack and parasitic feeding on other fishes by adult lampreys often results in death of the prey, either directly from the loss of fluids and tissues or indirectly from secondary infection of the wound (Phillips et al. 1982). Of the fish that survived attacks by lampreys, 85% of various species had been attacked up to five times (Scott and Crossman 1973). The species' introduction to the Great Lakes and its later abundance, combined with water pollution and overfishing, resulted in the decline of several large native species, including several ciscoes Coregonus spp., lake trout Salvelinus namaycush, and walleye Sander vitreus, among others. Consequently, there was a collapse in the commercial fisheries during the 1940s and 1950s in many parts of the Great Lakes, particularly in lakes Huron and Michigan, and in eastern Lake Superior (e.g., Lawrie 1970; Scott and Crossman 1973; Christie 1974; Lee et al. 1980 et seq. ; Smith and Tibbles 1980; Becker 1983; Emery 1985; Courtenay 1993). Lake trout catch in Lake Huron fell from 3.4 million pounds in 1937 to virtual failure in 1947. In Lake Michigan, U.S. catch fell from 5.5 million pounds in 1946 to 402 pounds in 1953. In Lake Superior, catch dropped from an average of 4.5 million pounds to 368 thousand pounds in 1961 (Scott and Crossman 1973). In freshwater, sea lampreys are also known to attack white sucker Catostomus commersoni, longnose sucker Catostomus catostomus, redhorse Moxostoma spp., yellow perch Perca flavescens, rainbow trout Oncorhynchus mykiss, burbot Lota lota, channel catfish Ictalurus punctatus, northern pike Esox lucius, and common carp Cyprinus carpio (Scott and Crossman 1973). Sea lamprey predation, in combination with other factors (i.e., overfishing and hybridization with more common cisco species), led to the extinction of three endemics in the Great Lakes; the longjaw cisco Coregonus alpenae, the deepwater cisco C. johannae, and the blackfin cisco C. nigripinnis (Miller et al. 1989). During the late 1940s, the alewife Alosa pseudoharengus invaded the Great Lakes from the Atlantic Ocean. Because the sea lamprey had greatly reduced the population of large predators, alewife populations exploded and were followed by tremendous die-offs, resulting in additional changes to fish species composition in the lakes (Smith and Tibbles 1980). Sea lampreys also took a toll on the introduced salmon in the Great Lakes, much to the dismay of anglers and state fish agencies. Although the number of sea lamprey in the Great Lakes has been reduced, they still kill substantial numbers of lake trout in some areas and thus are impeding the rebuilding of established populations (Schneider et al. 1996, and references therein). Remarks: Early methods to control this species included mechanical weirs and electrical barriers (Scott and Crossman 1973; Smith and Tibbles 1980). Beginning in the late 1950s, sea lampreys began to be successfully controlled by use of the lampricide 3-trifluoromethyl-4-nitrophenol (TFM), a chemical agent that kills larval lampreys in their stream habitats (Smith and Tibbles 1980). The lampricide has reduced the population by over 90% of the 1961 peak (Scott and Crossman 1973). As a result, commercial fisheries reportedly have shown some recovery (Smith 1985; Page and Laird 1993) and the sea lamprey's impact on native fishes has been reduced (Page and Laird 1993). However, continued use of TFM is apparently required to keep sea lamprey populations under control (Scott and Crossman 1973; Becker 1983). TFM is sometimes harmful to other fish (e.g., walleye) (Becker 1983), as well as to the larvae of nonparasitic lamprey species. Results of an international symposium on the sea lamprey were published in the Canadian Journal of Fisheries and Aquatic Sciences in 1980. The demise of lake trout led to development of the splake, a hybrid between lake trout and brook trout. It was hoped that the hybrid would better avoid lampreys and mature faster, hence spawn at least once before becoming parasitized (Scott and Crossman 1973). As of 1991, it was estimated that the U.S. and Canada were spending $8 million per year on lamprey control and another $12 million per year on lake trout restoration (Newman 1991). The sea lamprey is one of the most important invasive species in the Great Lakes. Although perhaps the first invader to the Great Lakes, having migrated out of Lake Ontario in the 1830s and into the other Great Lakes through the Welland Canal, it was not until the 1950s that impacts on fisheries were so great as to prompt serious management efforts. It was then that the Great Lakes Fisheries Investigations, the progenitor of the present day USGS Great Lakes Science Center in Ann Arbor was charged with discovering a lampricide targeting the larval stage. The Great Lakes Fisheries Commission was also formed at this time, an organization primarily concerned with sea lamprey management. Successful application of lampricide ensued, reducing the lamprey population dramatically. However, decimation by sea lamprey of predatory fish representing the top trophic levels of the Great Lakes food web had already caused another invader, the alewife, to proliferate. The alewife population exploded, causing fish kills that washed up on shore. Thus the sea lamprey created the need to control alewife. Due also tothe decimation of native predatory fish populations by sea lamprey, a Great Lakes sport fishery was created with the stocking of Chinook salmon in the 1960s. There is currently a debate as to whether the sea lamprey are indigenous to Lake Ontario. Randy L. Eshenroder summarized the argument for and against this belief (Eshenroder, 2009, 2014). Analysis of mitochondrial DNA by Waldman et al. (2004, 2006) seem to show that sea lamprey is native to Lake Ontario and Lake Champlain. This hypothesis is contrary to the commonly held belief by Smith (1971) that the sea lamprey entered the lake by hitchhiking under boats after the construction of the Erie Canal in the 1820's. Smith proposes that the sea lampreys entered the Hudson River, went through the Erie Canal, entered the Oneida Lake, then entered the finger lakes and Lake Ontario. Waldman disagrees with Smith and maintains that the reason the sea lamprey was not seen before the canal was built is that it was rare due to cold water and lack of suitable habitat. He suggests that the population boomed after the canal was built because the environmental degradation associated with human settlement created a more hospitable habitat for the sea lamprey. There is much debate about the many haplotype differences seen between the Atlantic and Lake Ontario populations. Waldman believes that the presence of unique haplotypes in the lake (haplotypes B amd P) could not have developed in the short time between the opening of the Erie Canal and present time supporting the argument for nativity. Others suggest that the unique haplotypes observed could have simply gone extinct in the Atlantic or that more sampling needs to be done to find them. It is also possible that the sea lamprey could have invaded the lake more than once. Waldman et al. (2009) wrote a comment in response to the issues raised above by Eshenroder (2009). Waldman did further genetic analysis on the Atlantic populations of sea lampreys and still maintains that the unique alleles found in Lake Ontario, but absent in the Atlantic coast collections, would have taken between 15,000 and 31,000 year to develop. He also refutes the hitchhiking under boats hypothesis by citing the difficult path the migrating lampreys would have had to follow including shallow pools, stagnant water, and complicated canal locks. Waldman also raises the issue that the "hitchhiking" behavior is actually a feeding behavior which is not exhibited in migrating lampreys - such as those entering the Hudson River. The lampreys would also be migrating in response to pheromonal signals sent from conspecifics upstream. These pheromones would be lacking in the Hudson River unless there was a population of sea lamprey already in the area. Eshenroder (2014) argues that P. marinus first entered Lake Ontario during a watershed breach between the Susquehanna River (in which lamprey are native) and Lake Ontario in 1863. The debate is yet unresolved. Adair, R.A., and R.J. Young. 2007. Integrated management of sea lampreys in the Great Lakes 2006. Annual Report to the Great Lakes Fishery Commission, Ann Arbor, MI. Applegate, V.C. 1950. Natural history of the sea lamprey (Petromyzon marinus) in Michigan. U.S. Department of the Interior, Fish and Wildlife Service Special Scientific Report: Fisheries 55. 237 pp. Aron, W.I., and S.H. Smith. 1971. Ship canals and aquatic ecosystems: equilibrium has not been achieved since the Erie, Welland, and Suez canals were built. Science 174:13-20. Bergstedt, R.A., and M.B. Twohey. 2007. Research to support sterile-male-release and genetic alteration techniques for sea lamprey control. Journal of Great Lakes Research 33(2):48-69. Bryan, M.B, D. Zalinski, B. Filcek, S. Libants, W. Li, and K.T. Scribner. 2005. Patterns of invasion and colonization of the sea lamprey. Molecular Ecology 14:3757–3773. Courtenay, W.R., Jr. 1993. Biological pollution through fish introductions. 35-61 in B. N. McKnight, ed. Biological pollution: the control and impact of invasive exotic species. Proceedings of a symposium, Indiana University-Purdue University, Indiana Academy of Science, Indianapolis, IN. Cudmore-Vokey, B., and E.J. Crossman. 2000. Checklists of the fish fauna of the Laurentian Great Lakes and their connecting channels. Canadian Manuscript Report of Fisheries and Aquatic Sciences 2500: v + 39p. Eshenroder, R.L. 2009. Comment: mitochondrial DNA analysis indicates sea lampreys are indigenous to Lake Ontario. Transactions of the American Fisheries Society 138:1178-1189. Fetterolf, C.M., Jr. 1980. Why a Great Lakes Fishery Commission and why a Sea Lamprey International Symposium. Canadian Journal of Fisheries and Aquatic Sciences 37: 1588-1593. Fisheries and Oceans Canada (FOC). 2009. Sea Lamprey Control. http://www.dfo-mpo.gc.ca/regions/central/pub/bayfield/06-eng.htm. Accessed 26 July 2012. Francis, G.R., J.J. Magnuson, H.A. Regier, and D.R. Talhelm. 1979. Rehabilitating Great Lakes ecosystems. Great Lakes Fishery Commission. Tech. report no. 37. Gerking, S.D. 1955. Key to the fishes of Indiana. Investigations of Indiana Lakes and Streams 4:49-86. Great Lakes Fishery Commission. 2012. How are Sea Lampreys Controlled. Available http://www.glfc.org/sealamp/how.php#trap Accessed 2 August 2012. Great Lakes Fish Health committee (GLFHC). 2000a. Sterile-male-release technique. An innovative sea lamprey control method. Fact sheet 6, Ann Arbor, MI. Great Lakes Fish Health committee (GLFHC). 2000b. Sea lamprey barriers. New technologies help solve an old problem. Fact sheet 5, Ann Arbor, MI. Gunderson, J. - Minnesota Sea Grant, Duluth, MN. Jelks, H.L., S.J. Walsh, N.M. Burkhead, S. Contreras-Balderas, E. Diaz-Pardo, D.A. Hendrickson, J. Lyons, N.E. Mandrak, F. McCormick, J.S. Nelson, S.P. Platania, B.A. Porter, C.B. Renaud, J.J. Schmitter-Soto, E.B. Taylor, and M.L. Warren. 2008. Conservation status of imperiled North American freshwater and diadromous fishes. Fisheries 33(8):372-407. Jones, M. 2007. Toward improved assessment of sea lamprey population dynamics in support of cost-effective sea lamprey management. Journal of Great Lakes Research 33(Special Issue 2): 35-47. Lawrie, A.H. 1970. The sea lamprey in the Great Lakes. Transactions of the American Fisheries Society 99:766-775. Lee, D.S., C.R. Gilbert, C.H. Hocutt, R.E. Jenkins, D.E. McAllister, and J.R. Stauffer, Jr. 1980 et seq. Atlas of North American Freshwater Fishes. North Carolina State Museum of Natural History, Raleigh, NC. MacEachen, D.C., R.W. Russell, D.M. Whittle. 2000. Spatial distribution of mercury and organochloride contaminants in Great Lakes Sea Lamprey (Petromyzon marinus). Journal of Great Lakes Research 26(1): 112-119. Madenjian, C.P., B.D. Chipman, and J.E. Marsden. 2008. New estimates of lethality of sea lamprey (Petromyzon marinus) attacks on lake trout (Salvelinus namaycush): implications for fisheries management. Canadian Journal of Fisheries and Aquatic Sciences 65:535-642. Madenjian, C.P., and T.J. Desorcie. 2010. Lake trout population dynamics in the northern refuge of Lake Michigan: implications for future rehabilitation. North American Journal of Fisheries Management 30(3):629-641. McLeod, D.V., R.A. Cottrill, and Y.E. Morbey. 2011. Sea lamprey wounding in Canadian water of Lake Huron from 2000-2009: temporal changes differ among regions. Journal of Great Lakes Research 37: 601-608. Miller, R.R., J.D. Williams, and J.E. Williams. 1989. Extinctions of North American fishes during the past century. Fisheries 14(6):22-38. Minnesota Department of Natural Resources (MDNR). 2012. Minnesota invasive species laws. http://www.dnr.state.mn.us/eco/invasives/laws.html#prohibited. Accessed 28 July 2012. Nepszy, S.J. 1988. Parasites of fishes in Canadian waters of the Great Lakes. Technical Report No. 51. Great Lakes Fishery Commission, Ann Arbor, MI. Newman, R.M. 1991. The invasion of foreign aquatic plants and animals. Minnesota-Out-Of-Doors 1991(May/June):16-17, 29. New York State Department of Environmental Conservation (NYSDEC). 2012. Lake Champlain Sea lamprey control. http://www.dec.ny.gov/animals/7240.html. Accessed 26 July 2012. Office of Technology Assessment (OTA), U.S. Congress. 1993. Harmful Non-Indigenous Species in the United States, OTA-F-565 (Washington, DC: U.S. Government Printing Office, September 1993). Page, L.M., and B.M. Burr. 2011. Peterson Field Guide to Freshwater Fishes of North America North of Mexico. Second edition. Houghton Mifflin Harcourt Publing Company, New York, NY. Patrick, H.K., T.M. Sutton, and W.D. Swink. 2009. Lethality of sea lamprey parasitism on lake sturgeon. Transactions of the American Fisheries Society 138:1065-1075. Phillips, E.C., M.E.Washek, A.W. Hertel, and B.M. Niebel. 2003. The round goby (Neogobius melanostomus) in Pennsylvania tributary streams of Lake Erie. Journal of Great Lakes Research 29(1): 34-40. Schneider, C.P., R.W. Owens, R.A. Bergstedt, and R. O'Gorman. 1996. Predation by sea lamprey (Petromyzon marinus) on lake trout (Salvelinus namaycush) in southern Lake Ontario, 1982-1992. Canadian Journal of Fisheries and Aquatic Sciences 53(9):1921-1932. Siefkes, M.J. 2009. Sea lamprey. 50-57 in State of the Great Lakes 2009. U.S. Environmental Protection Agency and Environment Canada. Smith, B.R. 1971. 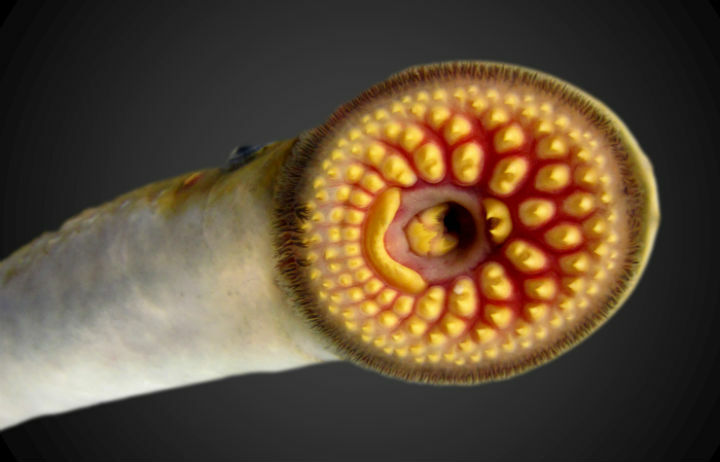 Sea lampreys in the Great Lakes of North America. 207-247 in Hardisty, M.W., and I.C. Potter, eds. The Biology of Lampreys. Vol. 1. Academic Press, New York. Smith, B.R., and J.J. Tibbles. 1980. Sea lamprey (Petromyzon marinus) in Lakes Huron, Michigan, and Superior: history of invasion and control, 1936-78. Canadian Journal of Fisheries and Aquatic Sciences 37(11):1780-1801. Tilmant, J.T. 1999. Management of nonindigenous aquatic fish in the U.S. National Park System. National Park Service. Vladykov, V.D., and E. Kott. 1980. Description and key to metamorphosed specimens and ammocoetes of Petromyzonidae found in the Great Lakes region. Canadian Journal of Fisheries and Aquatic Sciences 37(11):1616-1625. Waldman, J.R., C. Grunwald, N.K. Roy, and I.I. Wirgin. 2004. Mitochondrial DNA analysis indicates sea lampreys are indigenous to Lake Ontario. Transactions of the American Fisheries Society 133:950-960. Waldman, J.R., C. Grunwald, and I.I. Wirgin. 2006. Evaluation of the native status of sea lamprey Petromyzon marinus in Lake Champlain based on mitochondrial DNA sequencing analysis. Transactions of the American Fisheries Society 135:1076-1085. Waldman, J., R. Daniels, M. Hickerson, and I. Wirgin. 2009. Mitochondrial DNA analysis indicates sea lampreys are indigenous to Lake Ontario: response to comment. Transactions of the American Fisheries Society 138: 1190-1197.